Designing and Delivering Effective Education Programs provides an opportunity to benefit from the expertise of participants as well as program facilitators with the ultimate goal of becoming better educators and lifelong learners. The content is geared towards health-care professionals form all sectors of the health-care system who develop and deliver education programs. 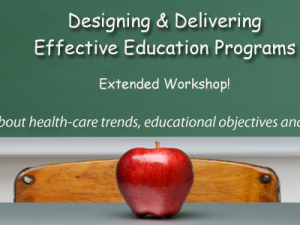 Fees include workshop materials, breakfast everyday, and lunches Monday. Wednesday and Friday. Accommodations are available at the Marriott Bloor/Yorkville, but are not included in the registration fee. Please call the Marriott and mention you are with the RNAO group to recieve our group rate.